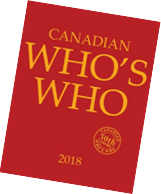 Please email info@canadianwhoswho.ca or call (416) 644-6479 find out more about Canadian Who's Who and what it can do for you. His Excellency the Right Honourable David Lloyd JOHNSTON	C.C., C.M.M., C.O.M., C.D., LL.D., D.D. former Barrister & Solicitor, Supreme Court of Ont. Rideau Hall, 1 Sussex Dr.
JOHNSTON, His Excellency the Right Hon. David Lloyd, C.C., C.M.M., C.O.M., C.D., LL.D., D.D. ; b. Sudbury, Ont. 28 June 1941; s. Lloyd Allen and Dorothy (Stonehouse) Johnston; m. Sharon d. Reid Downey 29 Aug. 1964; children: Deborah, Alexandra, Sharon, Jenifer, Catherine; 11 grandchildren; e. Sault Coll. Inst. ; Harvard Univ. A.B. 1963; Cambridge Univ. LL.B. 1965; Queen's Univ. LL.B. 1966; GOVERNOR GENERAL AND COMMANDER-IN-CHIEF OF CANADA 2010– ; Asst. Prof. of Law, Queen's Univ. 1966–68; Asst. Prof. of Law, Univ. of Toronto 1968, Assoc. Prof. 1969, Prof. 1972; Dean & Prof. of Law, Univ. of Western Ont. 1974–79; Principal & Vice-Chancellor, McGill Univ. 1979–94, Prof. of Law 1979–99; Pres., Univ. of Waterloo 1999–2010; former Barrister & Solicitor, Supreme Court of Ont. ; has served on num. prov. and federal task forces and cttes. ; former bd. mem. of num. companies incl. Arise, CGI, Fairfax, and Masco; Comnr., Ont. Securities Comn. 1972–79; Pres., Assn. of Univ. & Coll. of Canada 1985–87; former Pres., Conférence des recteurs et des principaux des universités du Québec; Founding Chair, Nat. Round Table on the Environ. & the Econ. 1988–91; mem., Harvard Univ. Bd. of Overseers 1992–98 (Chair 1997–98, first non-U.S. chairperson); Chair, Information Highway Advisory Council 1994–97, Cdn. Inst. for Advanced Rsch. 1994–99, NeuroScience Centre of Excellence 1994–99; Special Advr. to the Prime Minister of Canada 2007–08; Founder, My Giving Moment multi-media campaign 2013, Rideau Hall Fdn. 2014; academic specializations incl. securities regulation, information tech. and corporate law; 24 publ. books, incl. author: Canadian Securities Regulation 1977 (co-author: Supplement 1982), Business Associations 1979, 3rd ed. 1994, Canadian Companies and the Stock Exchange 1980, If Quebec Goes 1995, Getting Canada On-Line 1995, Cyberlaw: What You Need to Know About Doing Business Online 1997; honours: twice selected for All-American Hockey Team; Inductee, Harvard Varsity Club Hall of Fame 1963; Law Soc. Upper Canada LL.D. 1979; Officer, Order of Canada 1988, Companion 1997; Queen's Golden Jubilee Medal 2002; Order of Military Merit 2010; Commander of the Order of Merit 2010; Chancellor and Principal Companion of the Order of Canada 2010– ; Queen’s Diamond Jubilee Medal 2012; more than 20 Hon. Doctorates and num. hon. military appointments; Anglican; languages: English, French; recreation: cycling, skiing, skating; Office: Rideau Hall, 1 Sussex Dr., Ottawa ON K1A 0A1.